How to watch LEGO: Friends: Happy Birthday to You! (2017) on Netflix Netherlands! Yes, LEGO: Friends: Happy Birthday to You! is now available on Dutch Netflix. It arrived for online streaming on October 4, 2017. 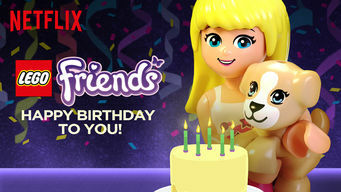 We'll keep checking Netflix Netherlands for LEGO: Friends: Happy Birthday to You!, and this page will be updated with any changes. Surprise! The gang's all here to celebrate your special day. And their playful animal pals will make sure it's a party to remember!